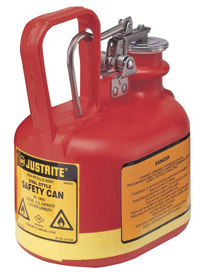 Ansul CleanGuard extinguishers from Safety Emporium provide clean agent protection without the global warming or ozone depletion potential of older Halon extinguishers. According to the NTP 14th Annual Report On Carcinogens carbon tetrachloride is "reasonably anticipated" to be a human carcinogen. Therefore, avoid contact with it whenever possible. Carbon tetrachloride was formerly used in a wide variety of applications before the carcinogenic hazard was well-known. One such use was as a fire extinguishing agent. Besides the carcinogenic hazard this poses, an additional danger is that carbon tetrachloride can form phosgene gas (Cl2CO, used as a chemical weapon in World War I) when used on electrical fires. If you ever come across a carbon tetrachloride extinguisher dispose of it as a toxic waste and replace the extinguisher with an appropriately selected model. Carbon tetrachloride was widely used as an industrial solvent before its health hazards were well-known. It is sometimes used as an intermediate (ingredient) in the manufacture of other chemicals, and it has a terrific degreasing ability. This latter property also resulted in its use by the dry cleaning industry in the 20th century, but this practice has long been abandoned. Regulations and taxes have helped to phase out the widespread use of carbon tetrachloride in most "first world" nations, however you are still likely to encounter carbon tetrachloride in academic and research laboratories. Carbon tetrachloride has a long atmospheric lifetime (approximately 85 years) and is both a highly effective ozone-depleting substance and a potent greenhouse gas. The phaseout of this substance on an industrial scale could not have come too soon! However, recent studies have shown that large, unexplained emissions of this chemical persist. A 2016 study suggests these emissions may be byproducts of the production of chlorinated organic chemicals. "Inorganic Reactions and Methods: The Formation of Bonds to Halogens, Part 1", Hardcover, 1989. Estimated price $229.94. Info and/or order. "An Inconvenient Truth: The Planetary Emergency of Global Warming and What We Can Do About It", Paperback, 328 pages, 2006. Estimated price $16.29. Info and/or order. "Halogenated Solvent Cleaners: Emission Control Technologies and Cost Analysis", Hardcover, 223 pages, 1990. Estimated price $72.95. Info and/or order . "Halogen Bonding I: Impact on Materials Chemistry and Life Sciences (Topics in Current Chemistry)", Hardcover, 280 pages, 2015. Estimated price $208.01. Info and/or order. "The 2019-2024 World Outlook for Halogen-Free Flame Retardants", Paperback, 268 pages, 2018. Estimated price $995.00. Info and/or order. SDS's often list the solubility of the material in various solvents. Carbon tetrachloride is often used a reference in this regard because it has a very symmetric molecular shape and distribution of electons, something chemists call a "non-polar" molecule. Non-polar molecules tend to dissolve other non-polar materials fairly well, but generally do not dissolve those that are polar. If you are actually using carbon tetrachloride in your workplace, definitely have an SDS on hand and take every precaution you can to eliminate and/or minimize its use. If you must use it, use appropriate personal protective equipment (PPE) and try to confine the material to a fume hood if possible. Download the NTP report on carbon tetrachloride in PDF format (166K download). Includes lots of interesting data. The ATSDR's ToxFAQ on carbon tetrachloride. The US EPA's Drinking Water Contaminants - Standards and Regulations. Scorecard's Chemical Profile on Carbon Tetrachloride. The International Programme On Chemical Safety's Report on Carbon Tetrachloride. Sigma-Aldrich's SDS for carbon tetrachloride.